Superman is without a doubt the most well known superhero that has ever existed on any comic book page. There are very few people in this world that do not recognize the “S” on his chest and identify it immediately with Superman. To say he is a legendary figure in the kingdom of comics would be an understatement. Superman’s villains are pretty identifiable as well. Lex Luthor is maybe the ultimate bad guy in any comic book series. People might believe that Doomsday was his toughest opponent since he sent Superman to his grave once before, but this is not the case. Superman had a much tougher opponent than Doomsday or even Brainiac. It all started with two high school kids that would often become bored in the classroom in Cleveland, Ohio in the 1930s. They were not the most popular kids and often had a tough time talking to girls. To pass the time, they would create their very own superheroes in their notebooks. Joe Shuster and Jerry Siegel were ordinary high schoolers when one day, they created Superman and slowly built up a story around him. They determined what his powers would be, how his tights would look, and how he had an undying love for reporter Lois Lane. Later on, this would open the doors for other superheroes to be created. Superman threw the gates wide open. On a side note, creating Superman was perhaps cathartic for Jerry Siegel. Not too long before, his 60 year old father died during a robbery. Conflicting reports state that he died from being shot or that he passed away from a heart attack during the robbery. In any case, it is kind of appropriate that he soon created a superhero that was impervious to bullets. Much like the origin stories for superheroes, Superman himself was created from the tragedy that befell upon Siegel and his family. The two teenagers kept on developing the origin of Superman and they felt they had created something special. The almost impossible task they faced was getting someone to agree with them. Nobody, no matter who they turned to, seemed to be interested in the Man of Steel. It would been easy for the kids to simply give up. They were teenagers after all. But they kept on pushing forward with the idea of Superman even when others thought they were crazy. Eventually they did a sort of fanzine at the time and published their own Superman comic. It was pretty shabby since neither of them were professional artists, but it was a beginning for them. Their rough around the edges comic did not set the world on fire. It took three more years for Shuster and Siegel to convince an independent publisher to take a look at Superman. The publisher, much to their delight, said he would print the Superman comic. But as was the practice back in the day, this also allowed the publisher the rights to the character. They received $130 from DC Comics for the rights to Superman forever. Not long after, Superman exploded on the scene and was everywhere. 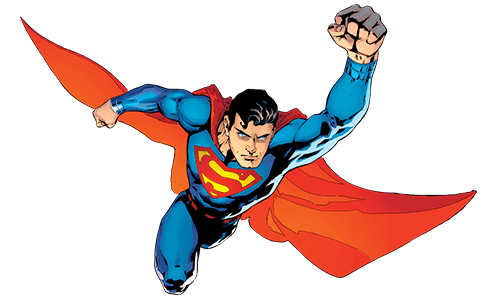 Superman debuted in Action Comics number one published by Detective Comics (DC). By 1941, Superman was popular in comic books and newspapers. Over 300 newspapers printed daily shorts of Superman comics across the country. Of course, Siegel and Shuster started kicking themselves around this time. A character they created was making millions and they were not receiving any part of it. Over the years, they sued DC for compensation relating to Superman. They would be awarded financial settlements here and there. Finally, when DC sold the film rights to Superman for millions of dollars, DC agreed to pay Siegel and Shuster about $35,000 a year for life and included their names in all Superman publications from there on out. Shuster passed away in 1992 and Siegel died in 1996, but the court battles have not ended. The family heirs are now battling DC for a share of the Superman profits. They have met in court several times with appeals being filed on both sides over the decisions. It does not appear there will be a final decision anytime soon. So you see, Superman’s toughest opponents were not arch-villains with crazy powers, but were the publishers that did not take two teenage boys seriously. Superman almost never saw the pages of a comic book, but thanks to Siegel and Shuster, he is one of the most recognized symbols of truth, justice, and the American way. Great and inspiring article, my friend. Thank you.